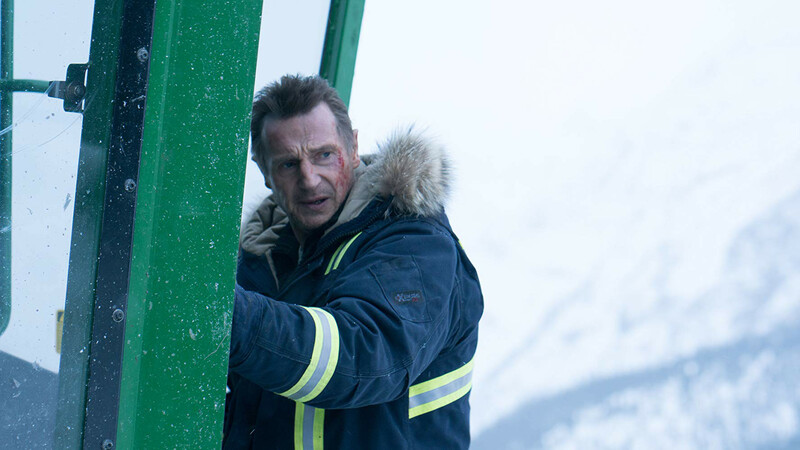 The wintertime Liam Neeson sad-dad action thriller for 2019, ‘Cold Pursuit,’ is just like most of the previous specimens and also completely different. This time, instead of rescuing a daughter, as he did in ‘Taken — the bellwether of this beloved or at least unavoidable subgenre — Neeson is avenging a son. His character, Nels Coxman, is not a globe-trotting assassin with a highly specialised set of skills, but rather a humble Colorado snowplow driver. For an amateur, Nels is awfully good at killing, and he takes to it with a grim determination that could easily be mistaken for enthusiasm. Neeson’s recent revelation, in a newspaper interview, that he once came close to acting out his own racist revenge fantasies might spoil some of the fun. Nels’ methodical, bloody extraction of payback is, as usual in this kind of story, righteous, sadistic and wildly disproportionate. On top of the bodies he dispatches himself, there are dozens of casualties in a war he unwittingly sparks between rival gangs of drug dealers. After members of one of these outfits inject Nels’ son, Kyle (Micheal Richardson, Neeson’s oldest son), with a fatal overdose of heroin, Nels works his way up the org chart, picking off guys with colourful underworld nicknames like Limbo and Shiv. At the top of the odious heap is Viking (Tom Bateman), a smug and vicious helicopter parent who forces his young son to drink green smoothies instead of the sugary cereals that are every American child’s birthright. Viking is a perfect ideological Rorschach blot of a villain: You could read him either as a preening liberal elitist or as a coldblooded Ayn Rand techno-capitalist, depending on what you hate most. Or maybe you think that’s a distinction without a difference. Whatever works. The mad-dad duel between Nels and Viking — spiced with hints of class and generational conflict — gets complicated when a third angry father is added to the mix. That would be White Bull (Tom Jackson), head of a Native American crime family. A truce between his people and Viking’s falls apart when Viking assumes that White Bull’s people, rather than Nels, has been killing off his minions. White Bull goes after Viking’s kid, and a patriarchal free-for-all ensues. Pity the minions. Moland pursues the mayhem with a degree of lowdown wit and a troll’s eye on the potential sensitivities of the audience. Each time a man dies, he is memorialised with a tasteful death notice on a black screen, with his real name as well as his underworld alias, and a glyph suggesting which maker he has been sent off to meet. There are a lot of crucifixes and totemic eagles, with an occasional Om sign and peace symbol thrown in for good measure. It’s like one of those ‘Coexist’ bumper stickers, and also kind of the opposite. This is the part of the review in which I note that ‘Cold Pursuit’ traffics in a bunch of dubious stereotypes and some questionable sexual politics. This will make some of you mad at the movie, some at me. White Bull’s band of Indians — who were Serbs in the Norwegian original and would be Mexican or Colombian in most Hollywood exercises of this kind — are half-noble, half-comical savages, mocked and honoured in turn, as they were in the old westerns. Just for fun, Nels has a brother, Brock (William Forsythe), whose gold-digging Asian wife (Elizabeth Thai), a former massage parlour worker, is basically a walking ethnic joke. The other women in the movie fare only slightly better, except for Laura Dern, who plays Nels’ wife and gets out as quickly as she can. Emmy Rossum as a ski-town cop is supposed to remind us of Frances McDormand in ‘Fargo,’ but bases her successful police work on the sexual manipulation of some poor sap in Denver. She is encouraged in this by her patrol partner (John Doman), who otherwise embodies what happens to a white man when he gives in to the imperatives of political correctness. Perhaps you think the same about me. I don’t really care. And please don’t get me wrong. I’m not accusing ‘Cold Pursuit’ of being casually sexist or accidentally racist. On the contrary: Its misogyny and racism strike me as perfectly deliberate, if also mostly disingenuous. That is, the movie works very hard to provoke a reaction like the one in the previous two paragraphs to justify the inevitable counter-reaction. And enjoying it can feel like an act of rebellion. Which I totally get. I have kids and grievances of my own and blah blah blah. I can’t deny that the glum, resentful, not-giving-a-damn masculine vibe of ‘Cold Pursuit’ has its appeal, as does Moland’s blunt knack for efficient screen violence. As for the star, Neeson has whittled his winter persona down to a haggard nub of weary anger, purging any inkling of gentleness, melancholy or self-awareness. The deadpan extremity of his performance is almost funny, except that in light of what we know now about Neeson’s past, it’s not funny at all. The thirst for revenge, in movies as in life, almost necessarily involves the dehumanisation of its target. And if the movie itself is best taken as a joke, it’s a very bad dad joke. Cold Pursuit is screening across the UAE.